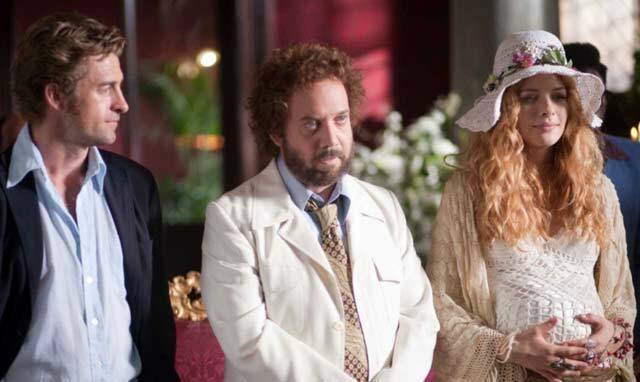 Scott Speedman (l.), Paul Giamatti and Rachelle Lefevre star in Barney's Version. Barney’s Version is based on the 1997 novel by Mordecai Richler (his final book), whose words gave us the films The Apprenticeship of Duddy Kravitz and Joshua Then and Now. Like Richler’s previous works, Barney’s Version is a serio-comic saga of Jews in Canada. Paul Giamatti (Pretty Bird) plays Barney Parnofsky, an irascible, cigar-smoking not-always-likable TV producer whose life we follow from his days as a bohemian college student in Rome, through his three failed marriages (to Twilight Saga: New Moon’s Rachel Lefevre, Conviction’s Minnie Driver and An Education’s Rosamund Pike, whom he meets at his wedding to Driver) and his experiences as a father of two and the son of an ex-cop, played by Dustin Hoffman (Little Fockers). The warts and all portrait of Barney reveals his endeavors at adultery, his obsession for hockey (hey, it’s Canada!) and the shooting of his best friend. Barney’s Version looks and feels like an independent film with big stars, and it is. The movie takes chances with characters you don’t see in many mainstream Hollywood efforts. In fact, it often feels like an effort from the adventurous 1970s that a Paul Mazursky or Hal Ashby may have directed. And that’s a good thing, although it also may alienate as many audience members as it wins over. Giamatti won a Golden Globe for his tour-de-force turn as the likable scoundrel, and the rest of the cast, from Hoffman on down, is handled nicely by TV veteran director Richard J. Lewis. It’s to everyone’s credit that the audience feels sympathy towards Giamatti’s louse-of-a-leading character through all of his travails, whether they be funny, nasty, sad or downright pathetic. The generous supplemental package on the Blu-ray/DVD set includes a commentary by the director, screenwriter Michael Konyves and, for a time, producer Robert Lantos; a handful of featurettes; and a lively 2010 Q&A session with star Giamatti and Columbia University film professor Annette Insdorf film.